Electric Fencing for poultry whether its be chickens, turkeys, ducks or geese is very effective method of containment or as a deterrent to predators. It can be installed for both domestic and commercial uses. Electric netting is a combination of poly wires intertwined with stainless steel conductors. Only the horizontal wires of netting are electrified except the bottom wire which usually sits on the ground as it would short the fence to the earth. Poultry netting is available in green and orange colours. Electric netting is closer meshed at the bottom and more spaced as you reach the top which is usually at a high of around 1m-1.15m. Poultry netting is available in 25m and 50m rolls. There is also electric netting gates for easier access to the pen. Either wooden or poly posts and fence wire works very well also at containing chicken or other birds. It is not suitable for containing smaller birds or chicks as any gaps can be exploited. To make sure these gaps are minimal you may have to use 8 or 9 wires with very close spacing at the bottom and with it getting larger as you go to the top. Either 2mm, 2.4mm galvanised wire or stranded wire is suitable in this type of fence. When used for for backyard chickens or poultry when chickens are kept indoors overnight poultry netting is the easiest to erect and move. All poultry netting we stock has built in posts with metal spikes that can be pushed into the ground. Once a bird gets a shock they are likely to stay away from the fence. Predators such as foxes are a big threat to backyard chicken and poultry netting provides the barrier to keep them out. For larger commercial flocks, electric nets provide an ideal inner fence or sub-division to contain poultry. Where predators are likely to be a threat, a more secure secondary boundary is recommended. All poultry nets have clips on each ends to enable the joining of further nets. Many commercial farms use a mixture of electric netting and post and 8 or 9 wire to contain the birds and keep predators out. Electric fence energisers that are used with netting are generally more powerful as it takes as much power for 50m of netting than it does on 500m of 2 strand tape fencing. Many of our energiser will have an indication of how many nets they can power. It is always recommend to use mains power, especially when predators are a threat as it gives a constant and reliable current to the fence. Please note that some very high powered energisers are not suitable for use with electric netting as they will burn out the connection. To make sure chicken fencing continues to work effectively it is important to manage to vegetation near the fence as generally the bottom wire will be very near to the ground. If vegetation touches the fence it will drain it and the voltage will drop. This can be done by strimming, using grass killer or installing plastic growth restricters. 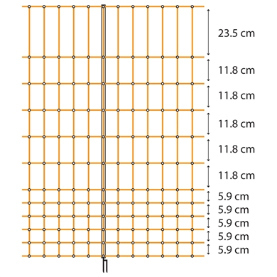 We have a good selection of chicken fencing kits that offer a variety of types of electric fence energisers, fence lines including poultry netting kits and fence line kits. Ultimately the kit you need will depend on your circumstances and if you are trying to keep predators out. If however you do not see a kit that contains what you need, we can make one for you.